Churros are always too greasy for me. I love these delicious baked ones, and dipped in chocolate sauce - heavenly! 1. Preheat oven to 400F (200C). Place two baking sheets on top of each other to bake the churros. This protects your delicate pastry. Line parchment paper; set aside. 2. In a medium saucepan, add water, brown sugar, salt and butter. Place over medium-high heat. Heat until butter is melted and mixture starts to simmer. As soon as it is simmering, whisk in the flour. Whisk until there are no flour lumps and a dough ball has formed. 3. Now, using a wooden spoon you want to stir the dough around you pot and cook it for about a minute over LOW heat. The mixture will clump and pull away from the sides of the pan. Just do it for a minute :), then take it off the heat and set aside. 4. In a small bowl, combine eggs and vanilla and whisk together. 5. Using your wooden spoon add incorporate a little of your egg mix into your dough. Stir and mash, breaking up the dough until loosened. Stir well until eggs are incorporated and mixture has the appearance of mashed potatoes. 7. Transfer your dough to a piping bag fitted with a star nozzle. 8. Pipe dough into long churros on the parchment-covered pans. Make sure to pipe them nice and thick. Do this by putting pressure on the bag and piping slowly. 9. Leave about 2 inches of space between the churros. 10. Bake for around 18-22 minutes or until golden brown. THEN turn off the oven and leave them in there for 10 minutes to dry a little. This step helps them keep their shape and not going flat once they cool. 11. Combine sugar, cinnamon and salt in a ziplock baggie. 12. Take the churros straight from the oven and toss them in the Roll churros in mixture until well covered. It is best to do this when the churros are warm and fresh from the oven. 1. In a large heavy saucepan heat the milk until to a simmer. 2. Combine chocolate, Heat the chocolate over medium heat, whisking frequently, until the chocolate is melted. 3. Whisk the cornstarch mixed with water (aka slurry) into the chocolate. 4. Cook over medium heat, whisking constantly, until chocolate mixture begins to bubble. Reduce the heat and cook for 2 minutes, whisking, until thick. 5. Remove chocolate from heat and stir in vanilla. 6. 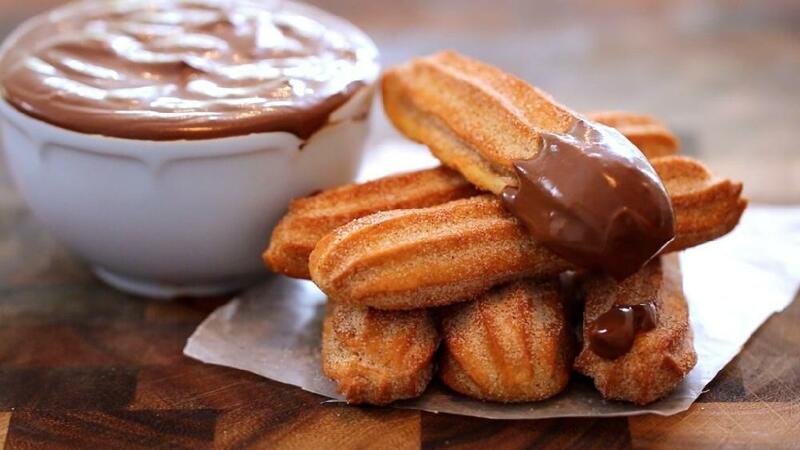 Serve in large cups with churros.